Adventist Mission | "A Vile Criminal Like Me"
"A Vile Criminal Like Me"
Maureen, who was brought up in a Christian home, got on her knees every night as she cried out to the Lord for her husband. He was also abusive, unfaithful, and drank a lot. Once he was locked behind bars, the parents of his wife, Maureen, urged her to leave him. “You don’t deserve that kind of life,” they told her. But Maureen wasn’t ready to give up. Working for a sales and merchandising company in the capital city of Port Moresby, Maureen met with international sales representatives who were doing business in Papua New Guinea. This is how she met Dennis Perry from the Adventist-owned Sanitarium Health Food Company in Australia. In addition, Dennis was involved with Operation Food for Life, a charity focusing primarily on meeting the physical and spiritual needs of the less fortunate in Port Moresby. When Dennis learned that Maureen’s husband was in prison, he began praying with her and gave her books to pass on to Philip. One of the first books Dennis gave was The Great Controversy by Ellen White. Maureen gave it to Philip, who read the first three pages and promptly put the book away. As Philip sat in his prison cell the Lord was working on his heart. One day he decided to again pick up the book that Maureen had passed on to him. This time he read page after page of The Great Controversy; he couldn’t set it down! Before long Philip had finished the book and wanted more. Dennis Perry was happy to hear of this and sent The Desire of Ages, Patriarchs and Prophets, and more to Maureen so she could pass them along. As Philip eagerly read each new book, his life began to change. Every week students from nearby Pacific Adventist University came to the prison to hold worship services and Bible studies. Philip faithfully attended, “and that’s where I accepted Jesus and the Adventist message,” he said. He was baptized in the prison. Once he became a Seventh-day Adventist, Philip wanted to share with his wife what he had learned. So when Maureen came to visit, Philip started giving the books back to her, urging her to read the material that had played such a significant role in changing his life. Maureen could see that her husband’s attitude, demeanor, and even appearance had changed radically. Eager to learn more, she began reading the very books that she had passed on to her husband. Before long, she too accepted the message and was baptized into the Adventist church. Prison officials and prisoners alike noticed the drastic changes that had taken place in Philip’s life. No longer was he a vile, arrogant, rebellious criminal. Instead, he showed a genuine caring for others. He was asked to serve as elder of the Adventist church within the prison and he frequently led out in ministering to the other prisoners. In addition, Philip was asked to serve as the coordinator of Operation Food for Life within the prison. In this way, Dennis Perry and other volunteers were able to bring food, clothing, and other humanitarian items to the prisoners. Because of the clear changes in his life and his exemplary behavior, Philip was released from prison to parole after serving a little more than half of his 30-year prison term. Philip now serves as coordinator of Operation Food for Life in Papua New Guinea. Maureen resigned from her job in order to join Philip in this special ministry. “Our passion is compassion as witnessed by our actions,” says the couple. A big way the Vakis show their compassion is by opening their three-bedroom home to struggling young people. Along with four children of their own, the family has 20 to 25 children and youth living with them at one time. During the weekend that number often swells to 40. “These kids come from broken homes, and often they have been abused,” says Philip. The Vakis strive to teach the young people to love the Lord “with all of their hearts.” They also teach them basic life principles from the Bible, encouraging them to stay away from drugs and alcohol. “We don’t want these young people to venture out onto the streets,” says Philip. “It’s better to prevent than to cure. We want to educate them not only for now but for eternity. 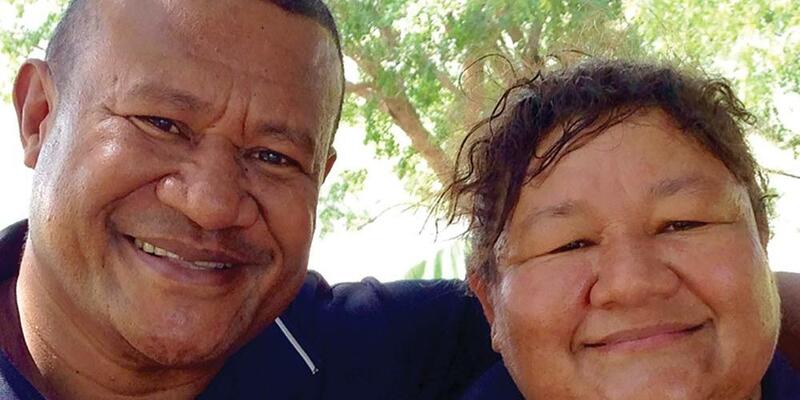 Philip and Maureen encourage the young people to get involved in helping others by participating in Operation Food for Life activities, including bringing food and clothing to some of the neediest people in Port Moresby. “We teach them to give dignity and hope to people who are stigmatized, and that hope is only found in Jesus Christ,” says Philip.